Carlingford, Co. Louth, is a fantastic orienteering area, with complex contour and rock detail and generally fast running conditions underfoot. 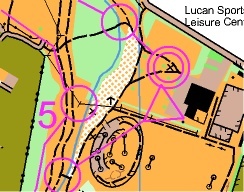 We mapped it for the 1993 Irish Championships and it is certainly a championship standard area. We have used it for Irish and Leinster Championships and for the Veteran (once) and Senior (twice) Home Internationals, as well as a two-day event with Lagan Valley Orienteers, and the Celtic Cup Ireland v Wales competition … and with the new motorway it’s only a little over an hour from Dublin! Three Rock Mountain – read some background here (from Wikipedia). It might, just, be a good news story … or a case study of how not to do it! Here goes …. In attempting the Moonwalk Challenge from Enniskerry to Laragh over the Wicklow mountains last Saturday night, I felt young Eoin was daring a mighty thing for an 11 year old – with not a hint of that “grey twilight” one Teddy Roosevelt dismissed all those years ago. His mission was as black and white as it gets. Weather briefing completed earlier that morning. Checked again later. Rate of change of position of approaching warm front from South East meant it would not hit until midnight, so looking good. Various injury/contingency scenarios agreed, given only two of us on our Team. The Captain of which was a child and the other who should know better. Left the car in Laragh, near Glendalough. Registration and gear check was completed at 1600hrs (following a very warm welcome to Eoin from the MR Team). Final safety briefing from Ronan, Rescue Leader. Bussed back to the starting point at Crone Wood near Enniskerry. Air of anticipation. We could barely speak to each other on the bus journey, a first. Disembarked into a dark wood. Adrenalin flowing, pulse racing, night vision adjusting. Altimeter (on watch) set for local atmospheric pressure, stop watch on, head torch on, map/compass aligned. Note to self, remember, he’s a child … 1732hrs … Go. After 25 minutes he emerged onto open mountain, the side of Maulin, with Djouce supposed to be in his 1000 position. No Djouce to be seen, alas, despite its 2,400 foot stature. Instead, thick fog with 10 metres forward visibility. How could I have gotten the weather so wrong? I really thought I had sussed the position of the leading edge of the front earlier and that we would be in clear, moonlit air for the duration. Simmering quietly to myself, while gasping for breath, I tried to keep up with Eoin. As it turned out I had correctly anticipated the position of the front, which was still some 100 miles away. But I failed to bargain on a micro climate phenomenon that you can sometimes get in the Wicklow Mountains, with a moist easterly wind coming across the sea. Never trust an easterly wind I always say to my students, it can bring fog. I was caught out by a higher dew point and orographic lift in the mountains. RTE’s Gerald Fleming sometimes describes this as fog “around the place” where the place can be any part of our island! Of all the times, we were in that place! Ronan had flagged the potential for poor visibility during the safety briefing, with a veiled reference to the humidity levels which I picked up on but, with rash self confidence, felt he was speaking of the later hours. That’s why he’s the Lead Rescuer and why I need to be more careful. Thank goodness I wasn’t team Captain – I would certainly have been asked to consider my position. Rule #1, never “assume” when it comes to safety, something either is, or it is not. No in-betweens. Having come to terms that we would be in effect “flying blind” on careful compass headings for the off piste bit of Djouce, it was another steep descent to a river crossing upstream from the top of Powerscourt Waterfall. No sign of the bridge in the fog, because it had been washed away in the heavy rains and resultant torrent of the Dargle the day before (remember last Friday!). Many of the paths just blended into an undefined mud-fest. Another surprise to rock Eoin’s comfort zone. And mine to be honest. Yet again the MR Team were there for us, giving everyone help across the top of the River Dargle. Human bridges being the best of them all. It also gave them a chance to discretely check that Eoin was ok, while not unreasonably assuming I would be hailing a taxi from somewhere like Roundwood in a short while, so tired I probably looked and only 35 minutes in. Onto the next ascent, the long haul up Djouce. Quietly passed another team who had set out ahead of us, and who we had never met before, but of course established a mutual friend within a minute. Ireland’s community spirit at its best. Meanwhile, Eoin continued to accelerate. My pulse well up for its usual sedentary 50. BMI stats being revised by the second. Suddenly, we were deafened by the sound of silence as the last choruses of Powerscourt Waterfall faded while Doppler and distance combined in the still air. As we ascended Djouce in the spooky fog I realised that the navigation was going to get serious. Despite powerful headtorches, we actually could not see the high viz guide flags that were put out for all teams, due to the 10m visibility. If anything we had to keep the lights faced down, like you do when driving in fog. In his first act of the equivalent of what we call “Cockpit Resource Management” the team Captain delegated navigation responsibilities to his Dad, and held my hand. We stuck to rigid compass headings on Djouce. There was a noticeable lack of other teams out there, because, unknown to us, there were none ahead of us. Sensible folk behind walking at a more refined and benign pace, and why wouldn’t they. As a result, we were very alone, rapidly gaining altitude in thick fog. Not a contingency I had planned for. Wrong again. Prospects as a Scout Leader or even a half good father well and truly impaired at this stage. A command decision was required. Eoin’s well being was not under question and I was in a mode unfamiliar to most of you. From a safety perspective we were only a few kilometres from the “point of no return” on Djouce. Bearings and altitudes agreed, spot timings reaffirmed …above all agreed that we stick together, we survive. It remained a “go” decision. I assured him we would be at a defined point that he would recognise by 1838hrs. For once that night I got something right, hint of street (dirt trail) cred restored. Eoin felt safe and all the more so when we bumped into another one of the MR Team (Declan) on the mountain to ensure everyone was well. Eoin’s spirits were further ignited by his own head torch … luminescent reflections from rain-soaked granite particles that found surface expression on the narrow paths,as we skipped around the summit of Djouce. Follow me my Captain ordered, correctly sensing that we were on course, his confidence regained having crunched out another thousand feet of climbing. He was now in the cruise. Not a bad ol‘ world out there at all we thought, even if he was, by then, cracking along at an aggressive pace by anyone’s standards. We had our share of slips and falls, but so many more laughs and rises. Covered in mud, as well as golden ingots of great memories. My head may have been in the clouds, but his feet were firmly grounded. I kept reminding myself that complacency kills, or certainly badly hurts, out here. It looks so easy from a distance. This was not a place to be testing Newton’s Law. It might have been a Moonwalk but 1G gravity was unfailingly present … and would especially be on the “boardwalk” that was to follow. Cool heads vital, one bad fall and that was it. I continued to seek refuge in my safe haven of number crunching, keeping a watchful eye on Eoin’s bearings & rates of change of anything I could find an excuse to calculate, to ensure he remained on track and schedule in the fog. As time progressed, I was not required. I was the one being minded. All of his hauls up Carrauntoohil & Lugnaquilla, Slieve Donard in a storm as well as countless sessions of night navigation had paid off. The Captain was in control. Living the dream, on a foggy wet bog on a Saturday night. Pain setting in … Our bigger Team and how you got us there! Nearly three hours in, our spirits fairly low, we emerged out of fog and cloud and caught a glimpse of lakewater lapping onto the sandy beaches of Lough Dan … moon rays from the Sea of Tranquillity piercing the rolling wavelets though the November night skies. Enough natural light energy to prompt the complete resumption of navigation duties by the Team Captain. When fatigue took hold, as it does, Eoin experienced the occasional, very temporary, moment of being “uncertain of position”, flight-deck speak for “lost” (the L word is never used, of course, and certainly not on our watch). Thanks to map, compass and no short measure of composure, he worked things out. He was in grave danger of becoming a good navigator. But there was still one more nauseatingly steep climb to go, up from Lough Dan … and this is where all you guys became the THE key part of our team, providing booster fuel beyond any packet of Dextrose. We were on a ticket to the moon … in the mind of the child (and the bigger one!). Mission critical texts received from Ed, telling us about 41 phases for Munster, and Josh who chanted Eoin out of his lowest point at the perfect moment. Several hundred other Capt. Kieran Fitzgerald’s inquiring as to the whereabouts of our “… pride” over the coming days was additional motivation! We were not alone. No way were we letting our bigger Team down. This was no place for “is feidir linn” or other such pleasantries. Failure is not an option, Eoin reminded me, lest we have that Apollo 13 moment, though we were well past the dark side (of the fog). However, Martin Luther King’s dream that “every valley shall be exalted, every hill and mountain shall be made low, the rough places will be made plain” was not going to happen tonight. Last thousand feet climb. Where’s that pride? Just do it, he said, and did. Before long, reaching the finish was becoming a distinct possibility. We reached the final checkpoint abeam Paddock Hill and were told by Sean, of WMR, that we had one old fashioned mile to go. Then I got that look from Eoin and I just knew what was about to follow. Dad, if we run the last mile, I can get in under 4 hours. My worst nightmare, it was 2123hrs and this meant he was about to pump out an 8 minute mile on boggy terrain. Interesting for a child with 24+km / at least 3,000 feet of actual climb under his belt and me with a backpack and further decades under the belt! Allowing a child to do this could render me officially “known to Gardai”. But the Captain wasn’t asking, he was telling me. His command decision and he looked disappointingly alert, clearly on a second wind! He accelerated towards a glide descent for re-entry into Laragh, near Glendalough, and finished in 3 Hours 59 minutes. Happy with that Dad?Eoin humbly inquired at the finish. I had just about enough energy to concur … echoes of the polite warnings of my sports doctor to take a few months’ rest resonating somewhere between my conscience, tendons and cartilage. Any hint of pain was well dissipated along the way by the positivity of the company I was lucky enough to be keeping … Eoin and the other walkers … as well as the tremendous support team from Wicklow Mountain Rescue who discretely and professionally oversaw and encouraged us all. It must have been a long night for them and I know they were keeping a special, trained, eye out for Eoin. I could see it in the gentle conversations we had with them at each checkpoint. Classic “human factors” assessments going on right under my nose. And then the hundreds of you guys who backed us all the way. This was some team to be part of, the two of us just being a tiny part. There was I, for years, thinking that Goodwill was an accounting entry. We try to inspire and, in so doing, realise that it is actually us who have been inspired … the circle of life, now I get it. All the better, every one of the 416 other walkers safely prevailed over the undulating 26km, with a smile – some finishing as late as 0200hrs, absolutely incredible people, they did it. They prevailed. People do.Success for the Mountain Rescue Team and participants from all corners of our island. Can do … did … will again, was the recurring theme from everyone over the aromatic cauldron of fresh stew so thoughtfully provided to all at the finish. Even as the adrenalin and serotonin levels stabilised, everyone still felt that the possibilities in life are endless. Because they are. But how did I get on Dad? Like any child, Eoin wondered on our way home to Enniskerry how I thought he did. We spoke of fundraising for a deserving cause, which was his primary objective and for which he has received an extraordinary response, thanks to you all (see link below). It was also nice to be doing this for a significant Scouting challenge, so a bit of collateral upside there too. His gentle smile at breakfast on Sunday morning left me feeling he might well have appreciated the sentiment. But, for Eoin, another day had dawned. The Moonwalk was old news and Kipling was (reassuringly) uncool. His gentleness at the breakfast table was subsiding rapidly like the mountains he had tamed the night before. There was a very important rugby match to be played with his Team and great friends in St Gerard’s. An hour later, while I hobbled meekly on the sidelines, Eoin sang some words from his school song … In defeat or victory, we’ll be the best that we can be. Bring it on, he echoed to me with backward glance, before focusing both eyes hard on the visiting opposition from Cheadle Hume. A resounding win for Gerards capped it all. But had it been the other way round, like real men, their heads would still be held high. That’s kids for you, I guess. Their definition of challenges will vary due to individual life circumstances, so we never try to rank them. The only measure that matters is that they get every chance – and give it a shot, whatever “it” may be. Go to places like Temple Street Children’s Hospital – some real world challenges being taken, head on, by some of the most amazing children on the planet. Putting what Eoin did into a diminutive context. Every single one of these kids, in their own special way, will be the people who will ultimately steer our nation onto a better course. That’s where we come in, just to help them hoist and trim the sails. But, in their own special way, and time. This particular challenge was one small(ish) step for a child to develop what I considered, for him, to be essential lifeskills – planning, courage, leadership, situational awareness, teamwork and, critically, being able to look out for others even at your lowest ebb. He reached for those stars, and caught them, even when falling. Were I even half the child at 11, let alone half the man, now. I can, however, be thankful to have been able to play a part – and to see the future it may bring. You too will, in your own way, and time. Thanks for that time this morning, and for your supporting Eoin and the Mountain Rescue Team. All of whom were children. Once. The SportIdent electronic punching system is the one normally used in Ireland and in most countries (except Norway and Finland). You can purchase an SI card from an orienteering equipment supplier (see IOA O-Gear page) or 3ROC will have a number of e-cards available to rent at each event. If you lose the rental card, you must reimburse 3ROC (about €40). 3ROC members can buy SI cards from the club at a special members’ price. If you have not seen a SportIdent electronic punchcard called an “SI card”, (sometimes also called an “E-card”, “dipstick”, “dibber”, “finger stick” “e-stick” or “finger thingy”), it is a small device, about 2-1/2 inches long and about as thick as a pencil. It attaches to a finger with an elastic band, and is usually worn on the index or middle finger. Attaching a short piece of bright orange or pink flagging tape to the card makes it more visible if you set it down or drop it. Please remove all duct tape, pins, etc before returning rental cards! Each SI-card has a unique serial number that is registered with its user in the event computer. During multi-day events, make sure that you use the same SI-card. If you have your own SI card, it is important to register it on the IOA SI Archive: this will speed up event administration as, when the SI card number is entered in the event computer, your name, club, class etc are all entered automatically in the system and don’t have to be typed in. To register your SI card on the archive, click here. Before you start, there are a few steps that need to be done. First, you need to register the card on the event computer. At a large event with pre-registration, you may have already had to provide the registrar with your SI-card serial number if you own one, or a specific SI-card may have been assigned for you to use. At most local events, you will either rent an SI-card for the day or bring your own and be asked to insert it into a master station that is connected to the event computer. It will read the serial number for the registrar. The registrar will then complete any other required information (name, course, class….). Next, you must prepare your SI-card by deleting old data and then checking to make sure it is working properly. Before you start, you will need to located the “clear” and “check” stations. These are usually located near the start. Insert your card in the “clear” station and wait until it beeps and flashes. This usually takes about 5 seconds. Now place your card in the “check” station. This verifies that your card is cleared and ready to use. It should beep and flash immediately. “Start” units. When the starter tells you to begin your course, insert your SI-card into the “start” unit. The start unit should beep and flash immediately. This records your starting time on the card. You are now on the clock and should begin orienteering immediately. You MUST punch the start, otherwise your start time in the results system will be the default start time, typically 10.00 am. At the finish, you must punch a “finish” unit. These will be directly under (or next to) the finish banner. Your orienteering time does not stop until you punch a finish unit. At a large event, there may be multiple “finish” units. You only need to punch one of them. Once you have finished, you MUST go to the “download” / computer station. You should go directly from the finish to the download/results area. Follow the directions of the results team. You will insert your card in a download unit which is attached to a computer. It will need to be held for several seconds (like the “clear” unit) until it beeps and flashes. Results and splits will be printed periodically and you should be able to get a personal copy of your split times within a few minutes. If you have a rental unit, please turn in your rental unit to the results team. Again, please remove any duct tape and pins before turning in your card. Once an SI-5 version of the e-card has been cleared, it has the capacity to hold a maximum of 30 control codes with the punch time. An additional 6 control codes can be stored without punch times. In addition, it stores the check, start and finish punch information. If you do not clear the e-card before each race, your e-card may not have enough capacity to hold the punches/times for your current event. The number of write cycles is >50,000. Data retention >10 years. Unlimited life time. Also note that the start, finish and each control station retain the serial number of the e-cards that have punched at that station along with a time stamp for each (maximum of 10,880 punches). This information can be useful (especially at large events) to determine if runners actually started on a course (may have registered, but did not run) by checking the start unit and to check if runners have finished a course but did not report to the download station by checking the finish unit. All of this information can be helpful in determining the runners that are still out in the forest.